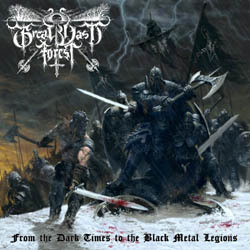 Brazilian black metallers Great Vast Forest will release their new album “From the Dark Times to the Black Metal Legions” on October 31st, via by Brazil’s Mutilation Records. It is the second full-legth album of one of the important and most extreme names of the Brazilian cult black metal scene, a band formed back in 1995. The new opus follows the musical and ideological line already consecrated by the same, but, more extreme. There are 10 tracks of pure black metal allied to an atmosphere of ancient, dark, profane and epic times, accompanied by an excellent graphic work. The album was produced and recorded by the band and it was mixed and mastered by Ivan Pellicciotti (bass player of the band Vulcano and owner and producer of O Beco Estúdio). “From the Dark Times to the Black Metal Legions” will be released in a killer triple-panel digipak CD format with embossed logo, 20-page booklet with lyrics, arts and album info, plus photos of the band members and live shows. The first copies of the digipak CD come with a poster.